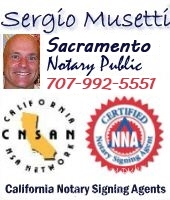 Linda Servis also notarize documents in Lafayette, Concord, Pleasant Hill, Alamo, Danvill, San Ramon, Moraga, Orinda. 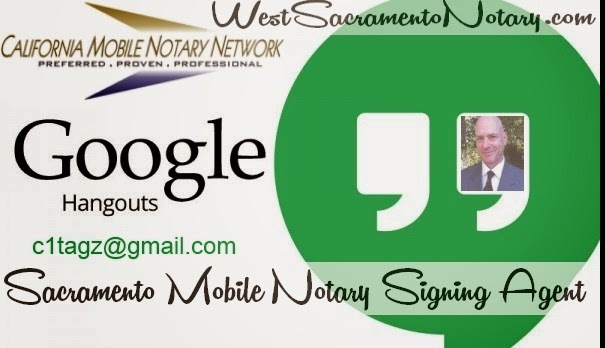 Loan Signings, mobile Notary. Private service company doing business at California Secretary of State. Changes to Limited Liability Company Filings: Effective January 1, 2014, there are changes to limited liability naming requirements and limited liability company filing requirements. Notary Public Services: Do you need to notarize your documents? We provide a Notary at your office, or residence. Apostille: We process documents that need to be certified, authenticated, apostilled by the Secretary of State, US Department of State, embassy legalization, federal documents. Sacramento refinance loan Notary Signing Agent. Completed signing for Express Signatures. Express Signatures LLC, located in Culver City, CA provides full Notary and Loan Signing services to various Lenders, Signing Agencies, Title and Escrow companies as well as the general public. We are also up to date with the latest technology. We can receive e-docs and sign the same day! Express Signatures LLC will handle all your notary needs, regardless of location, because we are Nationwide. We have the flexibility to accommodate busy schedules or non-standard working hours with daytime, evening and weekend appointments available. Real estate software firm a la mode has released a new version of its multiple listing service analytics iPad app and will no longer charge for the software. RE:Focus Analytics, which originally cost $49 a month, taps into 15 MLSs that serve 350,000 agents. The app lets agents dig up MLS data to generate reports based on factors including property type, geographic boundaries and property characteristics, and use the reports for comparative market analyses, listing presentations, blog entries, social media posts and other forms of marketing content. The latest version of the software offers new editing features that help agents better customize reports. RE:Focus Analytics stands out from some competing products like Realtors Property Resource (RPR), Cloud CMA and analytics features part of CoreLogic’s Fusion MLS because its tailor-made for the iPad, Moore said. Some agents have shown a desire to adopt MLS technologies that cater to the iPad. Connecticut Multiple Listing Service recently scrapped plans to convert to CoreLogic’s Fusion MLS partly due to a desire to find a solution that would offer better compatibility with the mobile device. Another aspect that sets RE:Focus Analytics apart is that it stores all data that comprises a user’s saved searches of MLS data on the user’s iPad, allowing agents who don’t have access to the Internet to still pull up MLS data and craft reports around it. A la mode originally charged $49 a month for RE:Focus Analytics when it introduced the app last year. Moore said before a la mode decided to make the app free it cost $399 a year. We are committed to the education of all California notary applicants at the best possible prices (with the highest quality training possible). Year after year, Golden State Notary has led the industry in innovative and cost-effective trainng solutions. Our online notary class or Notary DVD are unlike any other home study program available. We do not settle for text-based training. Live video with fill-in-the-blank work books are the best way to learn!. techniques so you will know the law as well as pass the exam. Our online and DVD course are taught using video of notary instructor Bruce Johnson. Don't settle for a text=base online course. Live classes are the best if you can take a day off work or have a free Saturday. Renewing your Notary Public commission. renewing notaries only. You must take and PASS your notary exam prior to your expiration date, otherwise you will have to take the 6 hour course again. Make sure you renew early! Secretary of State recommends to renew 4-6 months prior to your commission expiration. A recent assignment in Sacramento County was for Midwest Equity Mortgage. In their page they advertise (on this date) a 3.5% down to purchase a home and for their refinance loans "Getting your refinance application approved and closed in today’s environment is especially difficult. Underwriting and credit guidelines are more stringent than ever. You need to know you are working with someone that is up to date on the latest changes and knows how to navigate the system to get answers-fast. Midwest Equity hires and trains only the best Loan Originators. We back them up with all the support they need from: processing, underwriting and closing. This means your application is going to move through our system in a timely fashion and allow you to spend less time worrying." They have offices in Chicago, St Louis, Milwaukee, Miami, San Diego and Irvine. John Busher is the Branch Manager at the Irvine branch. John graduated from the University of St Thomas in St Paul, Minnesota in 2000 with a degree in Business Management. He began his career as a Personal Banker for a Fortune 500 Bank, moved up the ranks and accepted a promotion and transfer to Southern California in 2003. A year later he moved into the Mortgage Industry in San Diego. He was a top producer for a regional mortgage banker from 2003 until 2011. He joined the team at Midwest Equity in 2011 and was quickly promoted to Branch Manager. John’s 12+ years in the financial services arena make his knowledge invaluable as he pursues helping families save money. John and his wife Brenda, have three children, Jake, Nick and Mike. John oversees all daily operations of our Irvine Office. John has extensive mortgage banking experience and has originated hundreds of loans himself. Should you have any questions about your loan application which cannot be answered by your loan officer, or should you desire to reach out to John about anything, he is available anytime. John can be contacted at 949-390-6301 or at the Midwest Equity Mortgage webpage. You guys were great. The speed you guys work at its amazing, and Phil’s customer service is outstanding. You guys definitely won my business as my go to lender. I’m so glad to have teamed up with you guys. I’m working hard to send you guys all the business I can get. I look forward to a successful year together. Thank you! Right from the start we were impressed with Dave’s honest and professional approach. It was clear we were speaking with someone who knew his business well and was not going to lead us astray. We ended up going with Midwest Equity because Dave was patient and considerate while we shopped around. Once we got started, the whole process took less than ten days! Since we completed our refinancing, we have given Dave’s card out to three of our friends. We were nervous purchasing our first home but the guys at Midwest Equity calmed us down and made everything so easy to understand. Every company CLAIMS that they are the best. Well, Midwest Equity has every right to say they are! We called them to reduce our monthly mortgage payment, and they ended up paying off all of our revolving debt along with our mortgage. This saved us over $750 per month. Thanks again, guys! Personal service and attention are rare these days. I was pleasantly surprised to see that Pete and his team were there for me every time I called with a question. I honestly felt like I was his only client. We would recommend Midwest Equity to ANYONE looking to refinance. Their personal attention and professional service absolutely blew us away! This year the name of Certified Signing Agent, which is a notary expert in the mortgage document signing process, will be "SPW "Certified Signing Specialist". Certified Signing Specialists will adopt the standards of professionalism and practice as defined in theCertified Signing Specialist Code of Conduct. To obtain and maintain the Certified Signing Specialist designation, you will be required to sign an acknowledgment stating that you will abide by the Code of Conduct’s Standards of Practice. Certified Signing Specialists will follow a standardized script at the onset of a loan signing appointment, and will use the supplied standardized responses when explaining the function of specific loan documents when asked by the consumer. The SPW’s script is intended to be a guideline if the lender, title company or signing service does not provide one. You may use any script provided by a lender, title company or signing service that does not ask you to violate the law. Certified Signing Specialists will satisfy an annual background screening that follows the search criteria and scoring metrics defined in the Standards. Certified Signing Specialists will complete an annual examination with a passing score of at least 80%. The examination is currently under development and will be updated each year to reflect changes in the industry. Certified Signing Specialists will maintain Notary errors and omissions insurance coverage of $25,000. More information about the SPW and the Standards is available at SigningProfessionalsWorkgroup.org. Carol Ray at notary2pro has some comments regarding SPW compliance and fees. "First of all let me say that the NNA is maintaining that they are not in a position to represent notaries in their capacity as advisors to the Signing Professional Workshop. We are being told that they have little or no influence with members of the SPW. They are only instrumental in the formation of the group and are providing the website for the Signing Professionals Workshop. " " in all fairness to the notaries whose future is being decided by this small group of powerful people, a representative or representatives should be allowed to address this workshop. Apparently there is something in the works which may give notaries a voice in these proceedings. " "what we need to convey to this workshop is this; If you are truly trying to raise the bar for notaries so that you can feel comfortable and confident when you hire a signing agent who is certified using your criteria then you also need to extend RESPECT to these signing agents. You need to provide them with fees which will allow them to pay all of their expenses (including background checks, training, insurance, operational expenses, etc. etc.) and still be able to make enough of a profit to make a decent living. In addition to the base fees paid for the assignment, additional fees should be paid for additional time or work such as traveling long distance or faxing documents back. Most of the time we have to argue with the hiring party to be paid for any additional work required. This should be a given." So who will be authorized to provide a signing agent certification? Will the small providers be out of the game? Will Notary fees be fixed or based on offer/demand? Apostille service, legalization of documents. Para obtener Apostilla el proceso es diferente dependiendo del pais. En este caso primero se notariza el documento, luego viene el proceso de legalizacion. Una vez legalizado usted recibira los documentos (firmados, notariados, con Apostilla) a su direccion en Estados Unidos o su pais. Para mayor informacion vaya a nuestra pagina web. (Grand)Parenting 2.0 According to the National Census Bureau, grandparent-headed homes are among the fastest growing household types in the United States. Grandparent-headed homes are defined as living arrangements where the primary financial and care-giving responsibilities are held by one or more grandparents rather than a parent. Though the reasons that lead to this type of arrangement vary, many speculate that a difficult job market and bleak economy has led to an increase in the past few years. At the height of the financial crisis, the Wall Street Journal published an article describing the financial strain placed on grandparent-headed households. For grandparents who have already retired, finding a job at an advanced age can be next to impossible. The unemployment rates for this demographic are disproportionately high as are levels of ‘discouragement,’ or the part of the population so frustrated with trying to find work that they are driven from workforce. The degree of financial hardship is exacerbated by the increase in the price of everyday goods and necessities, like food and clothing. Beyond the financial strain, taking care of a young child can also have a significant impact on a grandparent’s mental and physical well-being. If an infant is placed in the grandparent’s care, he or she may have disrupted sleep due to nightly feedings. Grandparents raising young children are also frequently exposed to diseases and infections common in childhood. Depression and anxiety disorders are not uncommon and for children with developmental delays or behavioral problems, the demands placed on caregivers are that much greater. In some cases, grandparents may become the head of a household even when parents are present. In situations where a parent has become unemployed or otherwise cannot care for the children, he or she may move the entire family into his or her parents’ home. In addition to grandparent-headed homes, other types of arrangements where the parent is not the primary caregiver are on the rise. These may include instances where an aunt or uncle takes responsibility for a nephew or niece. Fortunately, many federal and state governments have started to recognize this trend and are putting resources in place to assist non-parent-headed homes. The American Association of Retired Persons has also created a comprehensive guide and resource center for grandparents parenting a child.